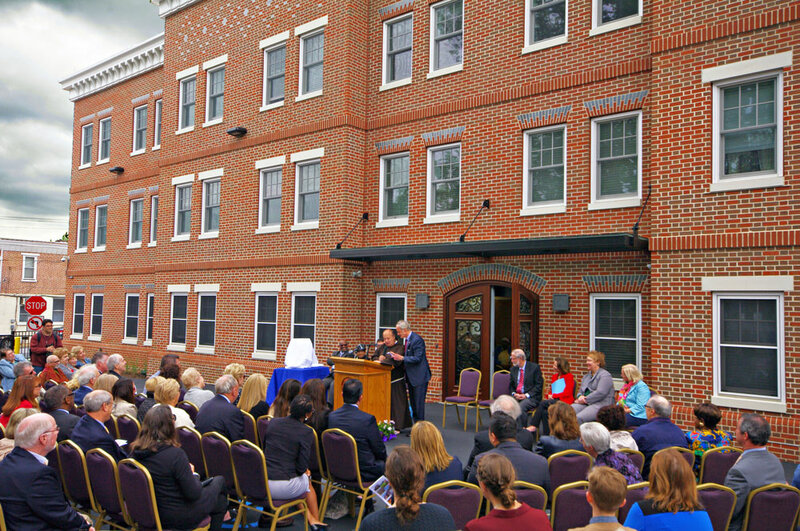 Sacred Heart Village II, Ministry of Caring's latest housing initiative, was dedicated on Friday to Julie & Charles Cawley. The Cawleys have been longtime supporters of the Ministry of Caring's initiatives to improve the lives of our city's poor. Although Mr. Cawley passed away in 2015 while the project was in progress, Mrs. Cawley continues their philanthropic efforts. Homsey Architects is proud to have made Ministry founder Bother Ronald Giannone's vision for the project a reality. The new building provides 25 safe, high quality apartments to low income seniors. The red brick complex includes laundry facilities on each floor, activity rooms, a caf‌é, a convenience store, and access to services all designed to promote social interaction. Located on the troubled East side of Wilmington at 625 East 10th Street, the building is a positive step in a new direction for the neighborhood.